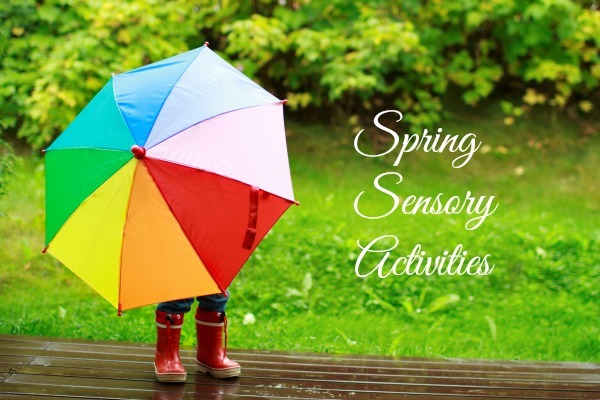 Welcome Spring by celebrating the winter thaw with a spring sensory bin and pouring station. The winter thaw is one of my personal favorite time of years. Growing in upstate New York, the lakes would freeze over the winter. In the Spring, the ice would make these huge booming sounds as the pressure gave and the ice broke. Being in the Midwest now, I wait for the big Spring thaw to see the green of the Midwest explode. 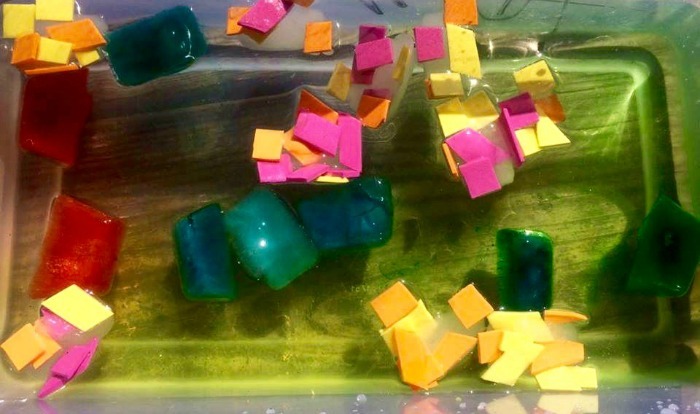 Today, Deanna of Play Dough and Popsicles shares her take on the winter thaw we Midwesterners crave so much every year with her inventive spring sensory bin. I live in the Midwest, where winter isn’t too kind. I try to think positive, but it doesn’t last long. Kids like to play in the snow, skate on the ice, drink hot chocolate, etc. I sort of like those things too, for five minutes, then I’m done. After five minutes, I start seeing sludgy snow covered in dirt, all the wet coats, gloves & boots that I will have to find a place to dry, air that’s so dry it makes my skin feel like sand paper (not to mention what it does to my hair), and then I turn into a hermit, never wanting to pass the four walls of my safe, warm house. Then, after a couple months of this winter crap, something amazing happens. The sun starts to shine warmer, the snow and ice start melting away, the earth starts getting color back in it’s cheeks, and the sounds of birds chirping wake me up instead of snow plows. It’s all around beautiful again. There is new life to explore in every direction, each having it’s own sweet smell. 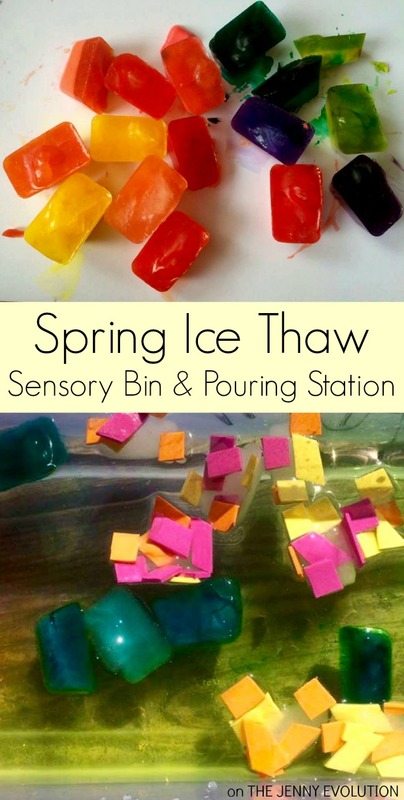 This change of seasons is what inspired this sensory bin and pouring station. The world once frozen eventually melts away with the warmth of the sun and turns into a color speckled world. 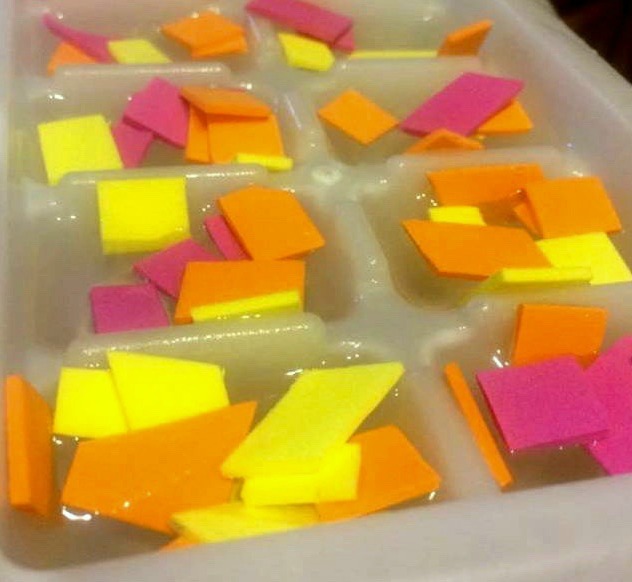 For this spring sensory bin, I took two ice trays and filled them up differently. The first is water, in each “ice cube” I mixed with a different combination of food coloring. I purposefully did more green ‘cubes’ versus any other color… you’ll see the significance below. For the second tray, I had my daughter cut up small pieces of colored foam. We chose yellow, pink, and orange because they seemed bright and colorful. 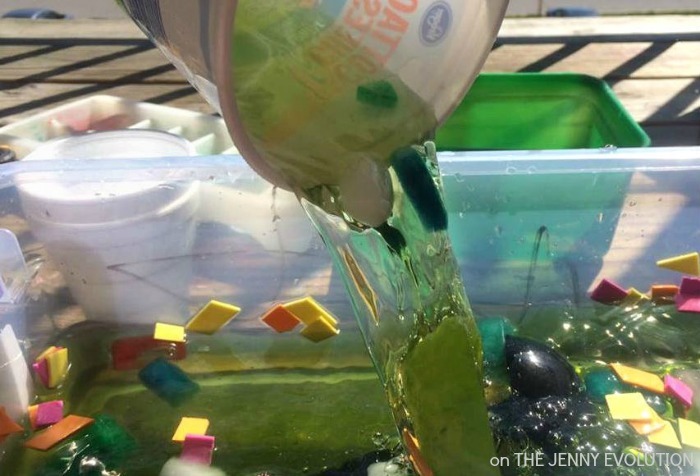 I started the sensory bin with plain water. As the ice cubes were poured into the plain water, they began to melt. The colors of the ice dispersed and mixed. It was just like the earth when spring is knocking on the door, about to kick winter to the curb. My daughter poured, scooped, splashed and stirred until all of the ice cubes had disappeared. What was left? 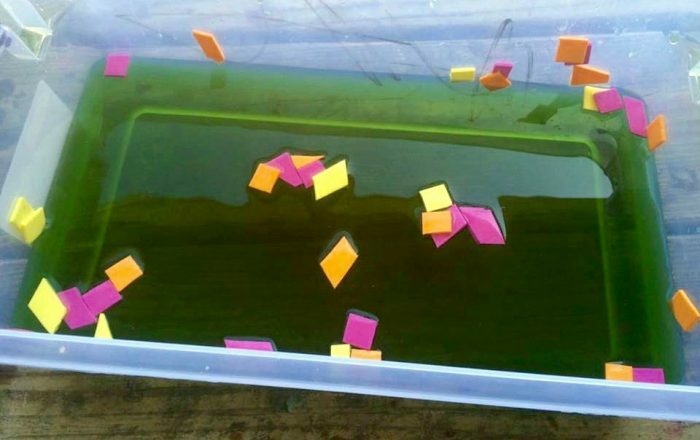 A beautiful green pool speckled with pink, yellow, and orange. When I look around outside, that is what I see. Beautiful green trees, bushes, and grass, speckled with yellow, pink, and orange flowers. The cold is gone and the spring breeze feels good on our skin. 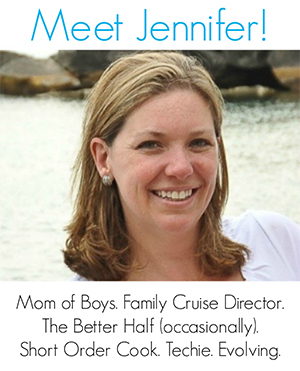 About Deanna: Deanna is the mom to a preschool daughter. She is inspired by so many other parents & teachers who are constantly helping their children learn through hands-on fun. She is obsessed with ‘trying’ DIY projects, exploring the world of food and finding recipes that the other 2/3 of my family (aka the pickiest eaters on the planet) enjoy! 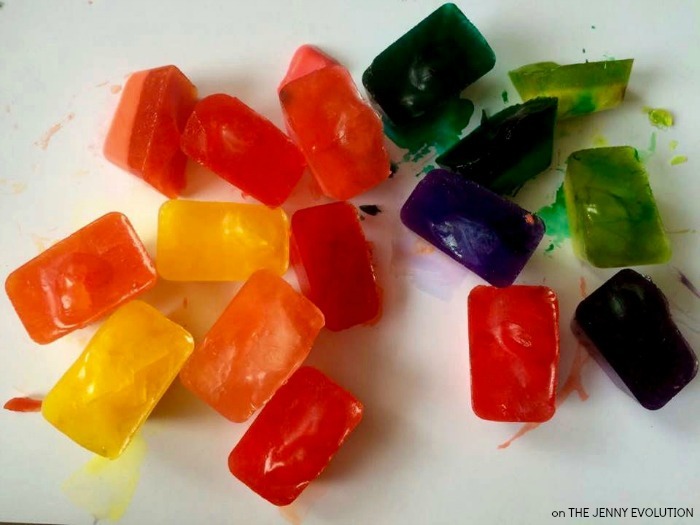 You can read more from Deanna on Play Dough & Popsicles. Oh man, my toddler will LOVE this!